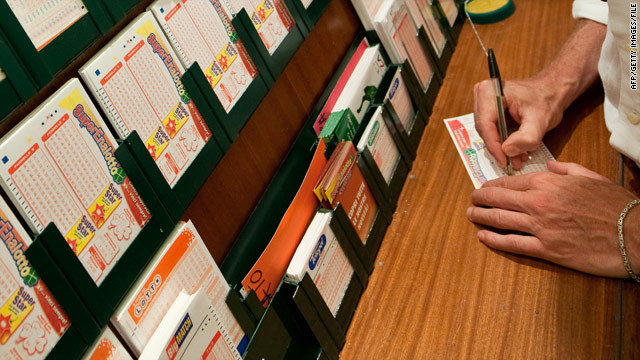 Canadian lottery officials say they’ve finally awarded to the correct people a 2003 multimillion-dollar jackpot that authorities say was fraudulently claimed by a lottery retailer’s relative. Seven men who played Canada’s Super 7 lottery together in December 2003 were awarded a $12.5 million jackpot plus $2.35 million in interest after being declared the rightful winners, the Toronto Star reported. Each will receive $2.1 million. The correction comes after three members of a family - two of whom worked for a Burlington, Ontario, lottery outlet – were charged last year on suspicion of stealing the winning ticket, according to the CBC. "We've got a classic bull versus bear battle going at these high levels, and I wouldn't be surprised to see the market pullback between 8% and 10%," Schrader said. Matthew Nestor, left, Jason Hayes and William Moyer were accused of obstructing justice. Three former Pennsylvania police officers accused of trying to cover up the investigation into the beating death of an undocumented Mexican immigrant were acquitted of the top charge of conspiracy. 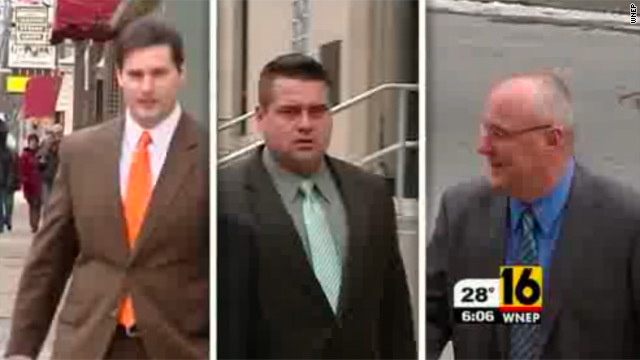 A federal jury found former Shenandoah Police Chief Matthew Nestor and officers William Moyer and Jason Hayes not guilty of conspiracy to obstruct a federal investigation in the July 2008 death of Luis Ramirez, a court official told CNN. The official had knowledge of the verdict but was not authorized to speak. Nestor was found guilty of falsifying reports and Moyer was convicted of lying to the FBI. Hayes, who was also accused of falsifying police reports, was acquitted of the two charges against him. "I'd just like to thank all the supporters I had, especially my family, friends and neighbors. I had so many well-wishers from Shenandoah," Moyer said after the verdict, according to CNN affiliate WNEP. Hayes said he will reapply for his job with the Shenandoah Police Department, WNEP reported. Ramirez, a day laborer and father of two engaged to a woman from Shenandoah, died three days after he was beaten into a coma in a street fight with members of the small mining town's high school football team. Derrick M. Donchak and Brandon J. Piekarsky were convicted of simple assault in state court last year but acquitted of murder, prompting an outcry from Latino groups and politicians. Pennsylvania Gov. Ed Rendell urged the federal government to pursue the case, resulting in hate crime convictions for the two young men. At the time of Ramirez's death, Hayes was dating Piekarsky's mother and the two are now engaged, according to WNEP. Moyer's son was a high school freshman who played football with the youths involved in the attack, according to an indictment. The three men were accused of helping the boys conceal their roles and of falsifying police reports. Moyer was also charged with witness tampering and lying to the FBI. Each of them testified in their defense and denied the allegations. An earlier ruling from a lower court said Rahm Emanuel didn't meet residency requirements for mayoral candidates. 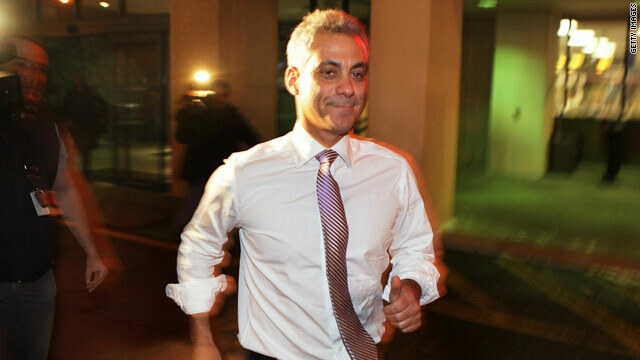 The Illinois Supreme Court has issued a ruling allowing Rahm Emanuel's name on the Chicago mayoral ballot. The court was considering a previous appellate court ruling that the former White House chief of staff does not meet the state's residency requirements for mayoral candidates. The state Supreme Court granted a stay on that decision and agreed to a motion for an expedited ruling. Emanuel is due to be in a mayoral debate Thursday night with the other major candidates: Gery Chico, Miguel del Valle and Carol Moseley Braun. The election is set for February 22. 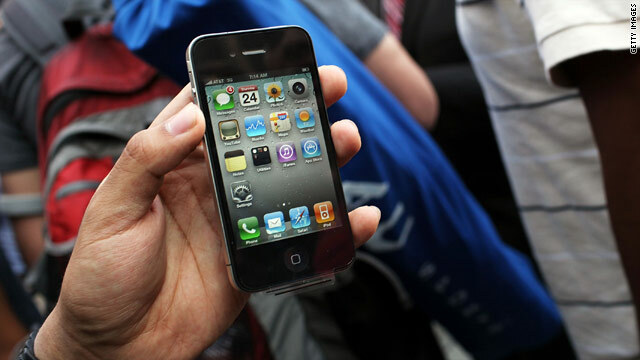 AT&T last quarter locked in millions more iPhone users who won't be switching (without penalty) to Verizon anytime soon. AT&T locks in 4 million iPhone users: The fourth quarter marked the last full quarter of AT&T's iPhone exclusivity agreement with Apple. Verizon will begin taking pre-orders for the phone on Feb. 3 and selling it in stores on Feb. 10. Verizon's iPhone won't spell disaster for AT&T. That's partly because AT&T customers will have to pay a $300+ termination fee and buy a whole new phone if they want to switch. First iPad newspaper to launch next week: News Corp.'s iPad-exclusive newspaper, The Daily, will be the guinea pig for Apple's new iPad subscription option. 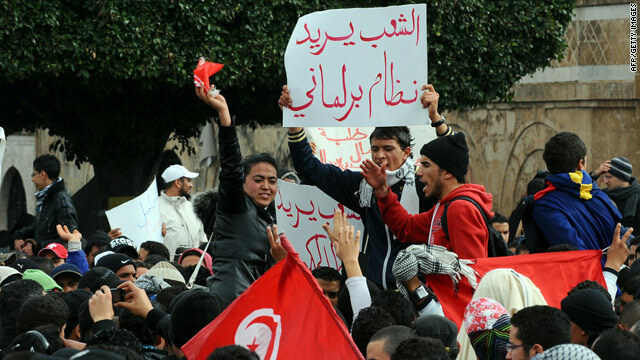 Protesters in Tunisia rely on social media to help plan demonstrations, experts say. There has been a common thread in the recent political upheaval in Tunisia and Egypt: Social media has played a role in both influencing the protests and reporting on them. "Social media is key to the revolution taking place in North Africa, and this may actually be the first time a government leader has lost power because of social media," said Darrell West, the vice president for governance studies at the Brookings Institution, referring to the ousting of former Tunisian president Zine El Abidine Ben Ali. However, social media isn't strictly a tool for those with a gripe with their government. Governments themselves have shown a willingness to use websites like Twitter for their own means in the wake of unrest, according to James Carafano, a senior research fellow at the Heritage Foundation. Jimmer Fredette led the Cougars to a 71-58 rout of San Diego State Wednesday. Any normal player might have gotten lost in the mayhem and hype of Brigham Young University's most anticipated basketball game in school history. 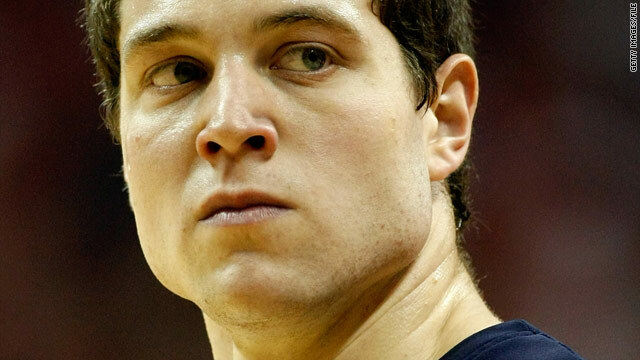 Jimmer Fredette is no normal player. The senior guard led the Cougars to a 71-58 rout of No. 4 ranked San Diego State Wednesday night at the Marriott Center. Though the nail-biting action of two top-10 teams battling it out lasted until the fourth quarter, the Aztecs fell short in their attempts to stave off Fredette's offensive charge. As SI.com’s Kelli Anderson writes: "The Aztecs, the best defensive team in the conference, threw all sorts of defenders at Fredette, from D.J. Gay to Billy White to Chase Tapley, sometimes two at a time. The defensive pressure frequently forced him to change his mind in mid-air and pass instead of shoot (and he coughed up the ball four times) but he still filled the bucket." The game marked Fredette's 15th in which he scored 30 points or more, clearly making him one of the school's most fabled athletes and one of the year’s biggest successes. He is on track to reach a rare milestone as well: nabbing a scoring title and the National Player of the Year award. He would join Bradley’s Hersey Hawkins and Purdue’s Glenn Robinson as the only three players since 1970 to achieve the honor. These small hand axes are at least 100,000 years old. 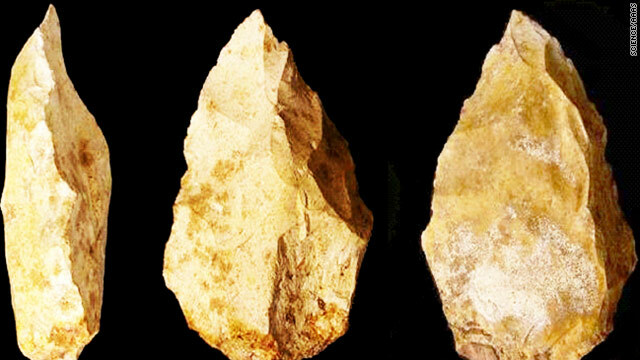 A team of scientists found these tools in the United Arab Emirates. Scientists have discovered new evidence suggesting that modern humans first left Africa to explore Eurasia much earlier than previously thought. An international team of scientists has uncovered a tool kit that indicates that modern humans, who looked and perhaps behaved much like us, must have lived in eastern Arabia about 100,000 to 125,000 years ago. The collection of small hand axes, scrapers and other tools was found in Jebel Faya, United Arab Emirates. A report about the discovery appears in the journal Science. The people who made these tools "are our ancestors, I have no doubt about that," said Hans-Peter Uerpmann, of the University of Tubingen in Germany, who collaborated on the project, at a press teleconference Wednesday. But the findings still do not prove definitively that modern humans made these tools, as the researchers did not find human remains near them, said Ted Goebel, anthropologist at Texas A&M University, who was not involved in the study. They potentially could have been made by Neanderthals or Neanderthal-like hominids, who were already in Eurasia at that time, Goebel said. Almost 300 protesters arrived at Athens University this week and are staging a hunger strike. Riot police in Athens, Greece, late Thursday surrounded a law school where 237 immigrants are waging a hunger strike, according to a Greek newspaper. The protesters, who arrived this week from the Greek island of Crete, are demanding residence permits, Kathimerini reported, and the police arrived after failed attempts to move the protesters to another building in central Athens. Five prosecutors are on standby in case police need to enter the building, the newspaper said. Athens University’s Law School and the government have been at odds over whose responsibility it was to handle the demonstrators. The prosecutor’s office for the appeals court announced an inquiry into whether the university failed to take action to prevent the immigrants from occupying the building. The Athens News Agency explained that under Greek law, university campuses are off-limits to police unless they have been invited or a serious crime has been committed. Greece’s majority party says leftists have abused the law and are using the immigrants as political pawns. 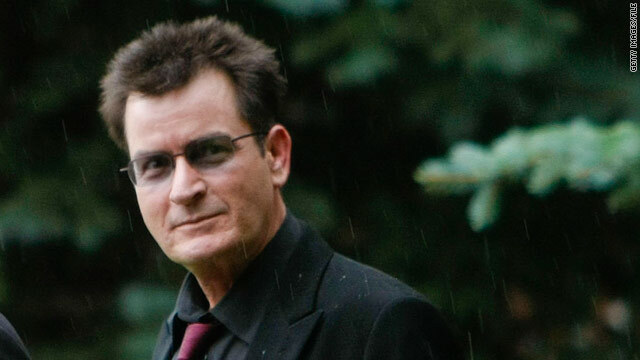 Charlie Sheen was taken by ambulance from his home to a Los Angeles hospital Thursday morning, his representative said. "All I know is he has severe abdominal pains and went to the hospital," Sheen representative Stan Rosenfield told CNN. 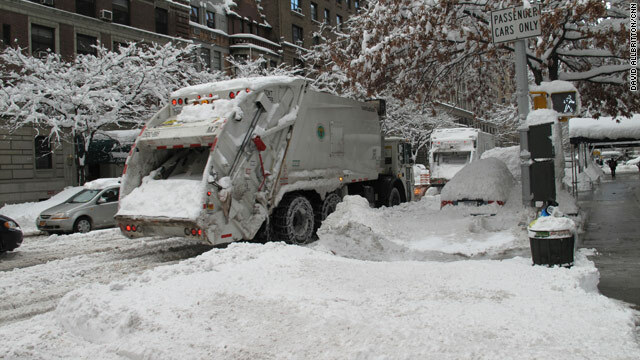 New York has never seen as much snow in January as it has seen this month. 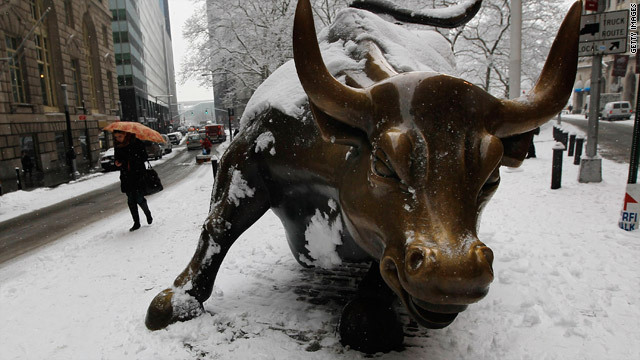 Records are falling with the snow in and around New York. Amanda Jones reportedly was to meet the man she thought was the father of her unborn child at the Hillsboro, Missouri, Civic Center horse grounds. This is the ninth case, and it will air on HLN at 9 p.m. ET. 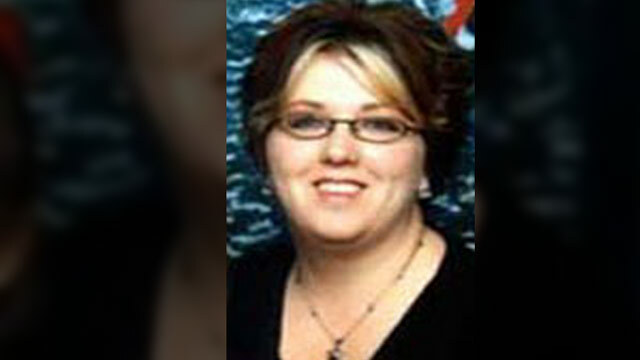 Amanda Jones has not been seen since August 14, 2005, when she was 26. The loan processor was last seen at the Civic Center in Hillsboro, Missouri, at the horse grounds. Jones was allegedly meeting the man she believed to be the father of her unborn son at the center. Her car was found at the center, unlocked with her purse still inside. She has not been seen since that day. "When we have information about a specific, credible threat, we will issue a formal alert providing as much information as we can," Napolitano said. That information will include a summary of the threat, steps authorities are taking to guard the public and what the public can do, she said. 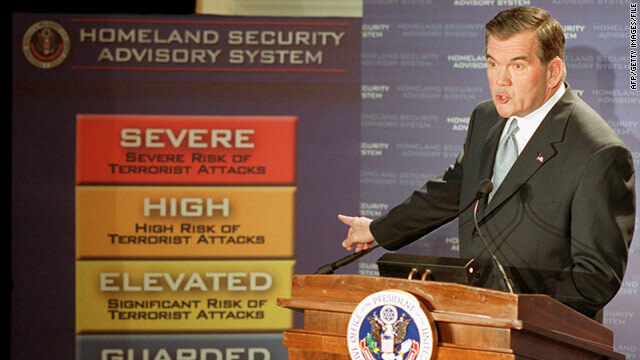 "The alerts will be specific to the threat. They may recommend certain actions or suggest looking for specific suspicious behavior. And they will have a specified end date," Napolitano said in a speech at George Washington University. 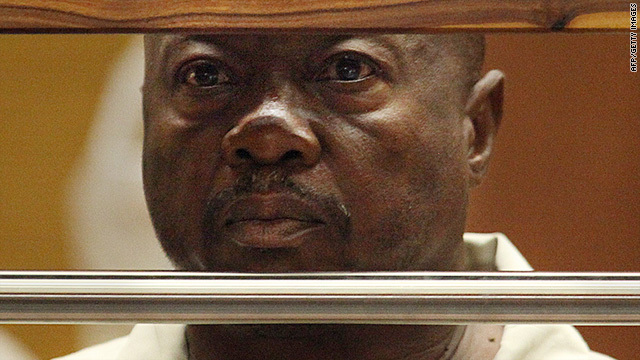 Grim Sleeper suspect Lonnie Franklin Jr., shortly after his arrest last summer. Los Angeles detectives assigned to the Grim Sleeper serial killer case say they are investigating two additional homicides that may be the work of suspect Lonnie Franklin Jr., according to an aide for an L.A. councilman in whose district some of the killings took place. The detectives also said there are four missing persons cases that may be related to the overall investigation, the aide told CNN.com Thursday. In July, 57-year-old Lonnie David Franklin Jr. was arrested and charged with 10 murders and one attempted murder related to slayings that date to 1985. He has pleaded not guilty. In 2009, CNN.com published a special cold case interactive on the decades-long hunt for the killer. Police were led to Franklin after his 28-year-old son was arrested and gave a DNA swab, authorities said. When authorities announced the arrest, they revealed that Franklin had, for a time, worked as a garage attendant at a Los Angeles police station. Detectives delivered the news about the additional cases at a community meeting Wednesday night at Bethel AME Church in South Los Angeles. They were responding to a question from a family member of one of the two homicide victims, according to the Los Angeles Times. Dennis Gleason, a spokesman for Eighth District Councilman Bernard Parks, told CNN that the possible additional homicide victims were identified through photographs related to the Grim Sleeper case that police released to the public in December. Shortly after Franklin's arrest, police searched his home and said they found Polaroids and videotape of many women. In December, investigators released some of those photographs (viewable here), which generated leads, they said. Franklin is in custody awaiting trial. Filed under: Courts • Crime • Justice • Lonnie Franklin Jr.
Police in Suez, Egypt, on Thursday battle demonstrators demanding the ouster of President Hosni Mubarak. populous Arab nation on Friday. 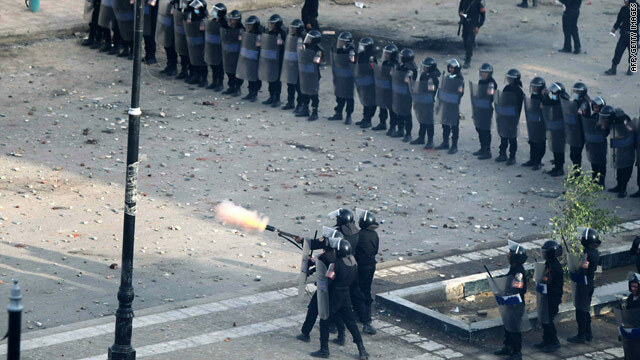 "The barrier of fear is broken," ElBaradei told reporters after he arrived in Egypt from Europe on Thursday. "And it will not come back." The county has been bracing for a huge outpouring of protests after Friday prayers. 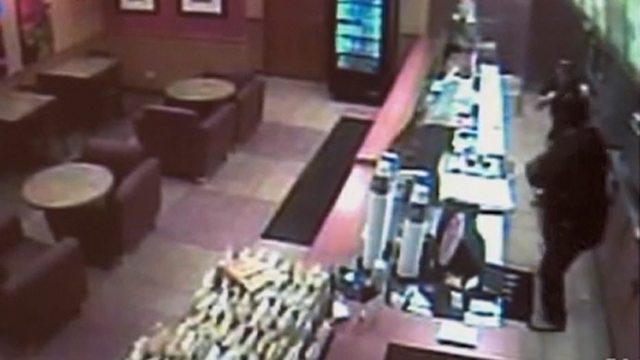 An Illinois Subway restaurant clerk battles a would-be robber who police say later led them on a chase in a stolen cab. Knuckle sandwich artist - Yesterday we received a video of a police chase in Illinois that ended when a stolen taxi clipped a school bus. Today, we learn the back story of that chase. Apparently, it was the result of a robbery gone wrong, foiled by a brave Subway restaurant employee whose specialty is crafting a sandwich of the knuckle variety. Two interesting posts popped up on the WikiLeaks site today. 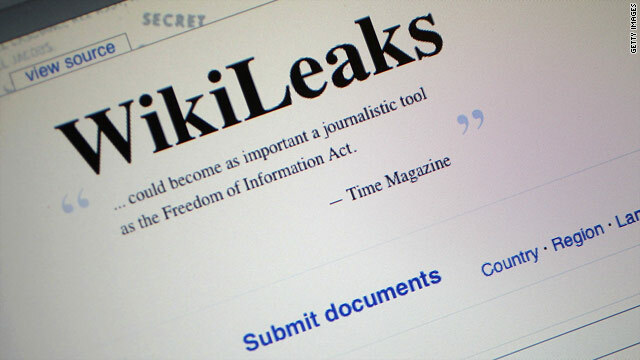 The first is the announcement of "The WikiLeaks Roundtable" on Tuesday, which would be the first of its "regular direct meetings with the public and press." WikiLeaks will take questions via Twitter (prefix "#wlquest" tag) and e-mail (twlrt@mail.be). The posting didn't explain who would be answering questions, or how much time would be available for the back-and-forth. But if you have a question, e-mails will be received until 6 p.m. GMT (1 p.m. ET) on Saturday. This first digital news conference of sorts will be videotaped, the posting promises, and broadcast at 11:30 a.m. GMT (6:30 a.m. ET) on Tuesday, according to the post. 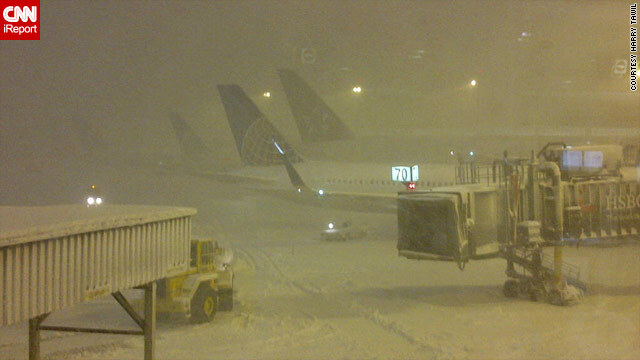 Planes wait out the snowstorm at the Newark, New Jersey, airport. The major snowstorm that pelted much of the Northeast will taper off Thursday, but many schools, government offices and some airport runways are expected to remain closed, officials said. Storms that stretched from the southern Appalachian mountains to coastal Massachusetts are the latest in a slew of wintry weather that continues to blanket much of the region. Even though the storm lasted a single day, it caused major problems in some areas, posting record snowfall numbers across the region, according to the National Weather Service. What will drug smugglers think of next? In an industry that thrives on innovation, some enterprising Mexican marijuana runners went medieval on the border fence, using a catapult to hurl bricks of weed into Arizona, authorities say. Grainy video from the Department of Homeland Security shows three men priming the throwing arm of the mechanism. Two of the men step away, and when the remaining man lets go, the catapult chucks its wares over the fence. Various media reports claim the device was capable of launching about 4 pounds of pot (or, presumably, any substance).